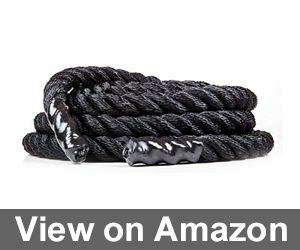 This 1.5-inch thick poly dacron rope comes in three different lengths: 30, 40 and 50 feet. It has anti-friction nylon-coated sleeves and heat shrink handles that make it heat-resistant, fray-resistant and unlikely to burn or blister your hands as you use it. 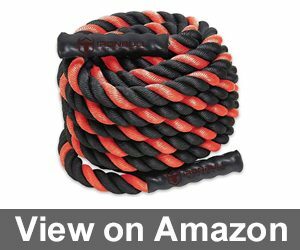 The 7.5-inch long nylon-coated handles give you plenty of room to get a good grip and are also slip-resistant, though it’s always a good idea to wear workout gloves when using this rope. Furthermore, the rope comes with a rope anchor included, which you can use to fix your rope to an anchor point for your exercise routine. Verdict: This is an excellent battle rope and is especially good for beginners. We wholeheartedly recommend it. This 1.5-inch rope from Firebreather Training is made of poly dragon fibers and comes in three different lengths: 30, 40 and 50 feet. The rope’s thickness makes it ideal for beginners and for cardio workouts in particular. Since you may choose between three different lengths of rope, you might buy either a shorter rope to take it easy or a longer rope to ramp up the difficulty. The rope also comes with a free anchor set, a protective sleeve to keep it from fraying or being damaged, and extra-long 9.5-inch heat shrink nylon handles to help you keep a tight grip on it without burning your hands. 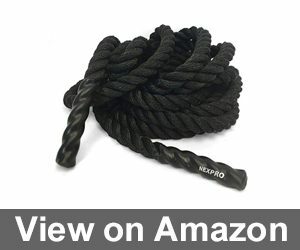 Verdict: This is an excellent rope for cardio workouts and is available at a good price. 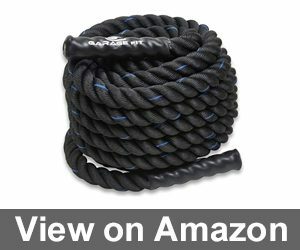 This especially versatile battle rope from Garage Fit wont only comes in 30, 40 and 50-foot long version, but also in 15.-inch and 2-inch versions for each of those lengths. This enables it to accommodate a wider range of workout styles and experience levels. What really stands out about this rope, though, is its flexibility. Most poly dacron battle ropes have an initial period where they’re a bit stiff, but this rope works beautifully just about from the beginning. The rope’s 10-inch long grips are waterproof and are so comfortable that you won’t even need gloves when working out. The longer and thicker versions of this rope can be a bit expensive, though. 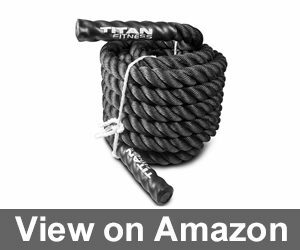 Verdict: If you want a thick and long battle rope for strength training, you will have to pay more than usual for this one, but the price is worth it when you consider its impressive quality. This rope is made of 100% polypropylene and polyester, making it somewhat different from the more typical poly dacron ropes that we have been considering so far. However, it’s quite strong and heavy. It’s 1.5 inches thick and comes in lengths of 30 feet, 40 feet and 50 feet. Ropes of these lengths weigh 12 pounds, 18 pounds and 24 pounds, respectively, so when you factor in the added strain of exercising with them, they’ll put your muscles under some intense strain. It’s also water-resistant, fairly inexpensive and has heat shrink placed at each end and meant to prevent heat damage. Verdict: This is a decent rope if you’re on a bit of a budget, but there are better models available at higher prices. These ropes are available in a wide range of lengths and thicknesses — 30, 40 or 50 feet long, as well as 1.5 or 2 inches thick. This makes them ideal for a wide range of different workout styles and regimes, as well as suited for people of varying fitness levels. They are made of tough poly dacron and won’t fray or come apart. Indeed, they are so resilient that they can stay together and retain their fluidity after years of regular use. The hand grips are secure and comfortable, though somewhat smaller than the hand grips on some other battle ropes. Verdict: This is a great battle rope noted for its versatility. Due to its small hand grips, though, it might not be right for people with large hands. This poly dacron rope is tightly braided so as to ensure that it will not fray, even after heavy use. 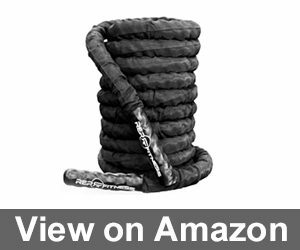 The heat shrink handles further augment this rope’s general quality, as they provide users with comfort and a reliable, no-slip grip. It’s water-resistant and comes in three lengths — 30, 40 and 50 feet — and two different thicknesses — 1.5 inches and 2 inches. This makes it versatile and suitable for people of virtually all fitness levels and workout styles. Though the longer and thicker versions of this rope can be somewhat expensive, on the whole, it is averagely priced. 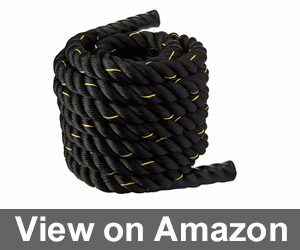 Verdict: This is an excellent overall rope and is especially flexible and durable after consistent use. We recommend it, even if longer and thicker versions can be expensive. Iron Bull battle ropes can be an important part the armory of any gym rat for the simple reason that they’re so astonishingly durable. Whether you’d like to use the as part of a home gym, outdoors or at a CrossFit gym doesn’t really matter because as much as you might try to bash them or pull at them, they’ll hold. These ropes come in thicknesses of 1.5 inches and 2 inches. 1.5-inch ropes can be 30, 40 or 50 feet long, while 2-inch ropes can be 30 or 40 feet long, making them excellent battle ropes almost regardless of your fitness level. Their remarkable durability is due in large part to their poly dacron construction. An anchor kit also comes included. Verdict: If intense workouts in which you expect to put your battle ropes though a great deal of abuse are your thing, we cannot recommend this rope highly enough. If you happen to be on a budget and are aiming to save money, this rope from Trademark Innovations is certainly worth a look. It’s made of poly dacron and is both durable and quite heavy. It’s water-resistant, is covered in nylon sleeves for friction protection and has heat shrink handles so that you can get a good grip on the rope. It only comes in two lengths, however: 30 feet and 40 feet. It’s also only as a 1,5-inch thick rope. Though this limits your options, the rope is still pretty good considering how inexpensive it is. Verdict: If you can’t afford to spend much, you may want to get this rope. But if you have money to spare, we recommend opting for something else. This battle rope from Comie, made of poly dacron, will cost you significantly less than most other battle ropes do, but also has much more available variation in size and length than is typical for rope’s in its price range. It’s the perfect combination of low price and high versatility. In its 1.5-inch thick version, it’s available at either 40 or 50 feet long. In its 2-inch thick version, it’s available at 30, 40 and 50 feet long. 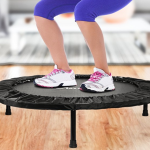 It’s got a waterproof nylon sleeve meant to prevent friction damage and keep it from fraying, and it can serve you well in a wide variety of different exercises. If you want to get yourself into shape without breaking the bank, look no further. 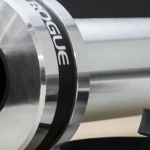 Verdict: You’re not likely to find a better battle rope for its price. We highly recommend it for those without much money to spend. 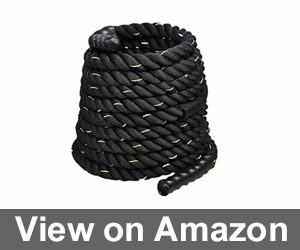 This truly excellent poly dacron battle rope comes in a wide variety of versions, truly maximizing your range of choices. It comes in 1.5-inch and 2-inch thick versions, each of which is also available in 30, 40 or 50-foot long versions. The weights of these ropes vary widely — from just 18 pounds all the way to a hefty 46 pounds — meaning that you’ll be sure to a find a version suitable to all fitness levels. Beyond this, the rope comes both in a standard version and in a version in which it is inside of a nylon sleeve. Both of these versions are extremely durable and fray-resistant, but the version in the nylon sleeve is much more so. The longer and thicker versions that come in a nylon sleeve are quite expensive, though. A strap anchor is sold separately. Verdict: If you have the money to spend and only care about quality, there is simply no better battle rope that you can get. 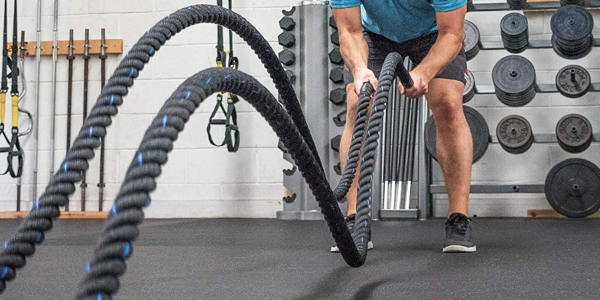 Now that we’ve told you a bit about some of the prominent battle ropes that currently available out there, we’d like to round out your knowledge base a bit more and provide you with some general information about battle ropes. 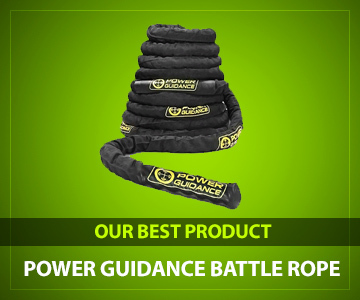 We know that you are ultimately the best judge of what you need, so we’d like to take this opportunity to answer a few common questions about battle ropes, go into some more detail about their general features, and show you what you can do with them. After all, the more you know, the easier it will be for you to make the right shopping decision. There are battle ropes made from a number of different materials. Most broadly, you can divide these materials into synthetic and natural types. Among the different synthetic materials used in battle ropes are things like polypropylene, dacron and nylon. Most synthetic battle ropes are made of a material called poly dacron, which, as its name suggests, is a combination of polypropylene and dacron. Poly Dacron: In these ropes, the dacron provides the hard outer layer, while polypropylene composes the softer interior. Poly dacron ropes don’t shed, but they tend to feel quite stiff when you first use them. Luckily, for well-designed ropes, this stiffness fades after a few uses. The best way to differentiate between a quality poly dacron rope and a shoddy one is price: better ropes are more expensive. Also, cheap, low-quality ropes feel less fluid when you use them and can prevent you from getting a good workout. It goes without saying that we only recommend high-quality poly dacron ropes. Manila: Manila ropes tend to perform excellently and are durable and heat-resistant, but because they are made of natural materials, they can sometimes be as much as 25% more expensive than synthetic poly dacron ropes. Also, Manila ropes leave little fibers and strands scattered around, especially after heavy use. This may not be a problem if you’re working out outside, but can be a pain to clean up if you are indoors. In addition to knowing what your ropes are made of, you should also make note of whether the ropes have any anti-fraying or water-resistant features. Battle ropes fray with frequent use and can come into contact with sweat or other moisture, which will cause damage. If a rope has shrink caps on it, that’s therefore a huge plus. Additionally, try to find ropes that are slip-resistant and easy on your hands, so that you don’t always have to wear gloves when using them. 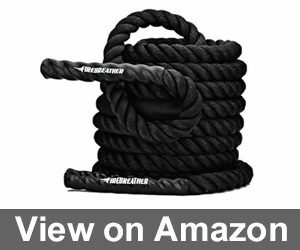 Length is another important factor to consider when choosing the right battle rope. The most popular battle rope lengths are 50, 40 and 30 feet — in that order. Since many exercises will require you to fold your rope in half at some anchor point, a 50-foot rope will give you 25 feet to work with for each arm. This is important because using a longer rope will mean that the motions in your exercises are more fluid. Shorter ropes will snap back more quickly as the pulse from your movement travels down the rope and back to you, possibly not giving you enough time to get a full range of motion on you exercise. Longer ropes therefore have significant advantages over shorter ones, which explains their relative popularity. However, using a 50-foot rope will require at least 25 feet of clearing space for most exercises, which most people will not be able to find outside of a gym. Longer ropes are also heavier and require more strength to use. It’s therefore a good idea for beginners either to use shorter ropes or to subject themselves to less intense exercises. As always, though, the “right” length of rope for you will depend on your level of fitness, your goals and how much space you’ll have to work out. Battle ropes come in three different thicknesses: 1.5 inches, 2 inches and 2.5 inches. The thicker the rope, the heavier it will be and the more grip strength will be required to hold on to it once you get going with your exercises. If you’re a beginner, we absolutely recommend starting with 1.5-inch thick ropes. 1.5-inch ropes are also best if a cardio-centered workout is what you’re after. By contrast, if you’re already quite muscular, have large hands, or want a workout focused on building muscle mass, give the 2-inch or even 2.5-inch ropes a look. 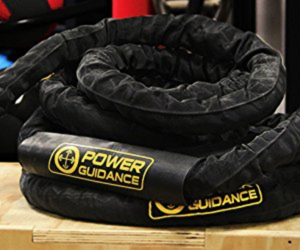 That wraps up our discussion of the 10 best battle ropes that you can find available today and what you need to know about battle ropes in general. Even though the truth is that any one of the ropes we’ve talked about here can help you get a grueling workout, we recognize that everyone’s needs and situation are different. Our hope is that you’ve now been equipped with the information you need to make the right decision and put yourself on the path to consistently having an enjoyable and challenging workout. From here, we wish you luck. May you get into phenomenal shape! 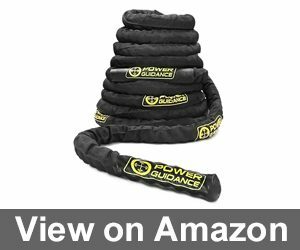 I’m not surprised POWER GUIDANCE Battle Rope is in the best product section. It’s the most durable battle rope I’ve ever used, I also like there are 3 length options. So, recommend this one for everyone who dreams of great quality for a reasonable price.